After couple of my reviews on Eastern products, tried my hands on their newly launched product " Noodles Masala". As I had mentioned in my previous posts " Eastern Review 1" & " Eastern Review 2 ", Eastern products are one of my favorite ones, which I have been using for the past 5 years and had recommended few products to my family members and friends. And also got a positive feedback from them too. All credits to Eastern :) Before jumping into my review, Thanking Eastern Condiments for giving such a lovely opportunity. 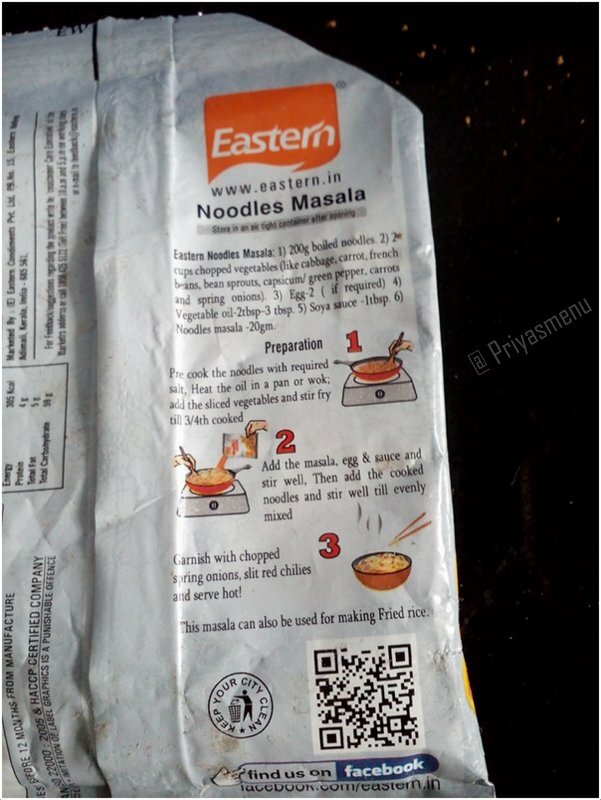 Eastern Noodles masala contains " Garlic , Salt, Coriander, Sugar, Dry onion powder, Black Pepper, Tamarind, Chilli and Soya sauce" and they have clearly mentioned that, it is free from Artificial colour, MSG and Preservatives. Coming to the price, it's just Rs. 10 which is very cheap and affordable. There is no complication in using this masala, all you have to do is, just follow the instructions given at the backside of the cover. The same masala can also be used for Fried rice. Noodles is one of my family's favorite menu and I always prefer plain noodles, so that more fresh veggies can be included to make it healthy. Usually, I prepare noodles using soya sauce and chili sauce and till now I haven't tried any brand of Noodles masala. This is the first time, tried using my favorite brand which actually disappointed me. I prepared the same way, which has mentioned on the cover but somehow felt that the flavor was missing. The noodles tasted bland and everyone in my family felt the same. I couldn't get the exact taste of noodles though the masala contains lots of flavorful ingredients. I wish Eastern Condiments take my review in a positive way and take steps to enhance the taste and flavor. My rating : 2 / 5 ! Flavor is missing. Disclaimer : This is an honest review based on my taste and preferences Only !